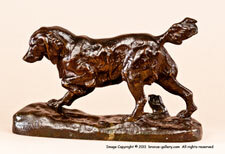 Antoine Louis Barye - 19th Century French Sculptor ! 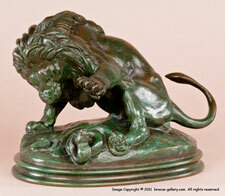 Antoine Louis Barye (1796 - 1875) was born in Paris, France on September 24th 1796. 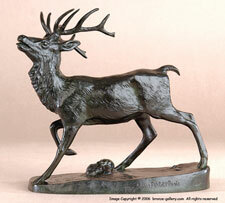 He was the first and acclaimed by most as the finest sculptor of the French Animaliers school. 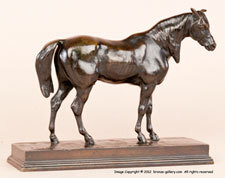 His work is almost exclusively studies of wild animals but he also produced equestrian groups as well as mythological figures. 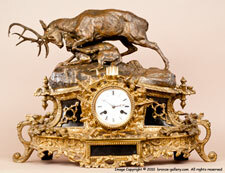 His animal sculptures are usually of a violent nature especially his works of the big cats. 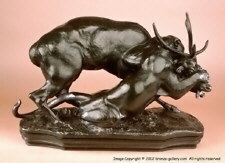 Barye was an accomplished artist as well as sculptor and his models are technically competent and based on his studies of actual wild animals, both living and dead, at the Jardin de Plantes, in Paris where he spent much of his time. 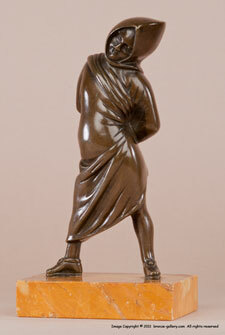 Barye's first Salon exhibit, The Milo of Croton, in 1819 was awarded the second prize, but many of his later entries were turned down. 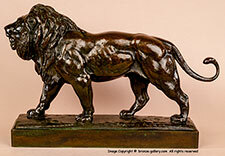 At the 1831 Salon Barye exhibited his masterpiece, Tiger devouring a Gavial, which was bought for the Luxembourg Gardens and now resides in the Louvre. The 1832 Salon saw the cast of Lion and Serpent, another masterpiece that was later installed in the Gardens of the Tuileries. 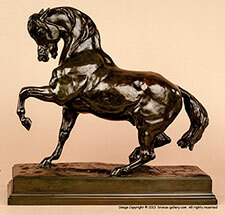 Even though Barye attained much commercial success with his bronzes and monuments, the committee of the Salon refused many of his entries, and the rejection in 1836 of most of his entries angered him such that he refused to exhibit there again until 1851. 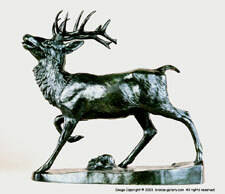 His Royal and State monumental commissions, as well as the patronage of the Duke of Orleans, and the Dukes of Luynes, Montpensier, and Nemours, allowed him to hire the finest foundry craftsmen in Paris and turn his hand to producing his smaller bronze models himself in his own foundry. 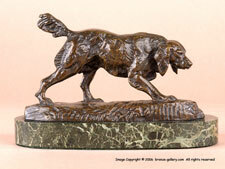 Even though the period from 1837 - 1848 is considered by most to be the zenith of Barye's career and most of his finest Animalier sculptures were done during this time, he was not financially successful. 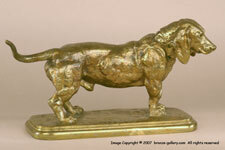 Many times Barye would not let a bronze leave his studio or be sold because in his opinion it was not perfect. It was during this time that he started cold stamping his casts, giving each one a unique cast number. 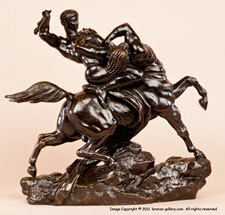 Because of this, almost obsession with the perfection of his sculptures and because of the financial crisis and revolution of 1848, Barye was forced to declare bankruptcy. His plasters, models, and the rights to produce them were sold to pay his debts. 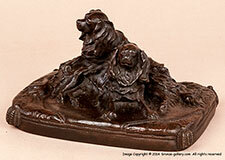 The casts made by Martin, Barbedienne, and others from the period 1848 - 1857 are not as well executed without Barye's personal hand and direction and are easily distinguishable from his finer early casts. After the bankruptcy and loss of his models in 1848 Barye became the Director of Casts and Models at the Louvre until he was replaced by Emmanuel Fremiet in 1850. These years were Barye's darkest times but it was not long before he started receiving the praise and acclaim that he most richly deserved. 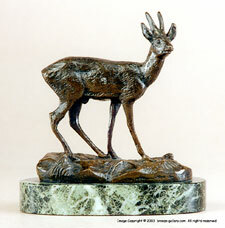 Many articles appeared about his works of the previous decades praising his incredible ability of capturing wild animals in their natural state. 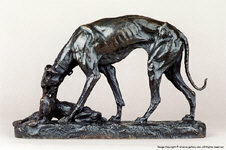 In 1851 Barye resumed exhibiting at the Salon with Jaguar devouring a Hare, another masterpiece destined for the Luxembourg Gardens and later placed in the Louvre. He was appointed Professor of Drawings at the Museum of Natural History at the Jardin de Plantes in 1854, a post he held until his death. 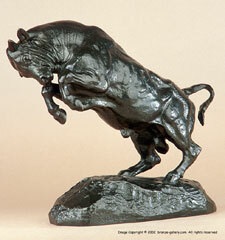 By 1857 Barye was able to pay off his debts of the last 10 years and regain control of the casts and models which he was forced to give up. 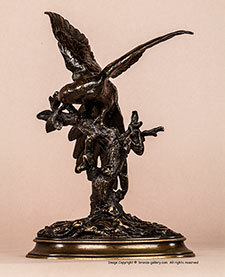 Barye again set to casting his works himself but his newly found success and the many State Commissions that he was awarded took up a great deal of his time. 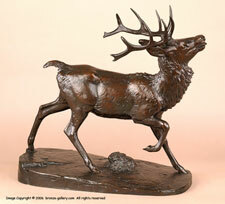 It was during the later part of his life that Barye was given the many honors and awards that he deserved in his youth. 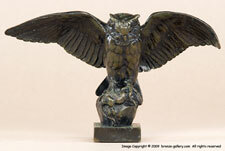 In 1855 and again in 1867 at the age of 71 he was awarded the Grand Medal at the Exposition Universelle in Paris for his works. He was elevated to the rank of Officer in the Legion d'Honneur, was named the first president of the Central Union of Beaux Arts and was appointed a Member of the Institute of France. 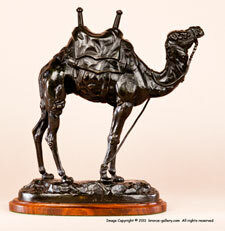 Barye produced no new works after 1869 and following his death in 1875 most of his plasters and models were purchased by Ferdinand Barbedienne, the famous founder whose earlier gold FB casts of Barye's works were so meticulously done. 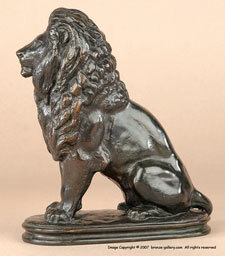 Barbedienne continued casting bronzes from Barye's original master models until after the turn of the century. 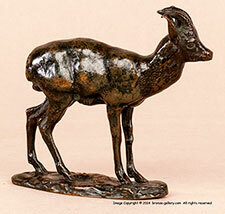 All of these later, posthumous, casts are marked F. Barbedienne Founder on them but they are done with extreme attention to detail and try to carry on Barye's keen interest in multicolored patinas on the works. 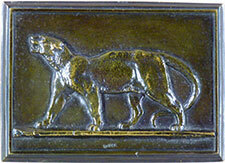 Today, most of Barye's plasters and models are the property of the Louvre.